Vassilios Karakoidas, Stephanos Androutsellis-Theotokis, Diomidis Spinellis, and Yannis Charalabidis. 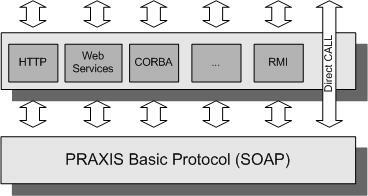 Applying MDA in enterprise application interoperability: The PRAXIS project. In Harald Kühn, editor, Workshop on Ontology and Enterprise Modelling: Intgredients for Interoperability , pages 76–84, December 2004. Abstract: This paper elaborates on the application of the MDA approach for achieve interoperability among existing Enterprise Applications, such as Enterprise Resource Planning (ERP) and Customer Relationship Management (CRM) systems, through utilizing XML/B2B interconnection standards, developing components and modifying existing systems where necessary. We present the PRAXIS project design as a specific case study of this approach, describing the way in which interoperability-oriented high level model mappings are providing the means for guiding the model-driven development of interoperable Enterprise Applications. Specifically, we focus on the transformation processes that drive the Computation Independent System model into the Platform independent and finally the Platform Specific Model, including our final design decisions for the PRAXIS system. Since the 1960s, Enterprise Applications development suffered from a lack of available technological solutions for organizing business processes . To deal with this issue, software engineers worked in the direction of developing software in the areas of Relational Database Management Systems (RDBMS) and Rapid Applications Development IDE (RAD). Researchers also developed methodologies for formalizing the design of Information Systems such as the Soft Systems Methodology (SSM)    etc. Recently, IEEE provided a series of guidelines for efficient system design and development . During the last two decades, many sophisticated systems were also developed to provide common ground for enterprise application development. These Enterprise Resource Planning systems (ERP) are widely used nowadays in the design of modern Information Systems (IS). In the last few years, however, the focus has shifted from the development of software systems to the integration between them, in other words dealing with the problem of interoperability. “… the ability of two or more systems or components to exchange information and to use the information that has been exchanged”. This is a particularly complicated task. Most systems developed and in use today by organizations were deliberately alienated with each other, making it very complex to find common ways to share business related information. While working on the PRAXIS system , we made some interesting observations regarding the problem of interoperability between enterprise applications. Figure 1 shows an attempt to categorise the driving forces that affect interoperability in Enterprise Applications development. Technical Standards: Enterprise Applications are based upon modern or legacy technical standards, such as XML , CORBA, and Java. In trying to make a system interoperable, one has to consider a wide set of standards in order to implement the solution. Technology Trends: Technology trends pose serious restrictions to interoperability. In fact, it is common practice that the implementation of an interoperable system is attempted with the use of the most popular technology instead of the most effective one. For example, the way in which XML  and Web Services  affected Business 2 Business standards such as ebXML  and UN/CEFACT . Similarly, according to recent research papers, ontologies are expected to be used as key technology for Enterprise Modeling . Business Standards: These are often used as the common language between enterprise systems. Attempts to design an interoperable system often depend on the usage of one or more business standard, for example, EDI , ebXML , RosettaNet  etc. Business Processes: It is a common case for enterprises to achieve a level of interoperability in the business process level. In fact, in order to design such a bridge, one must reengineer a set of common business processes between the enterprises. In order to face interoperability issues, an enterprise must perform some “light” Business Process Rengineering (BPR). EbXML  is a widely accepted standard that is trying to solve this problem. Considering the aforementioned facts, we attempted to find a formal and concrete way to design the PRAXIS system. The main objective of the PRAXIS system , which is particularly targeted towards SMEs, is to allow the interconnection of existing Enterprise Applications, such as Enterprise Resource Planning and Customer Relationship Management (CRM) systems, as well as their seamless interconnection with corresponding software applications of the public sector and financial institutions. This is achieved through the utilization of XML/B2B interconnection standards to support interoperability, the development components and the modification of existing systems where necessary. The goal is to support a variety of transactions, ranging from invoicing and sales cycle support to bank and tax payments. It is expected that the SMEs which will adopt the PRAXIS system will experience a significant reduction in the required time and the rate of errors involved in carrying out the various transactions, which in turn will offer an overall competitive advantage. The Model Driven Architecture (MDA) concept aims to facilitate the design and development of wide-scale enterprise applications in an evolvable and flexible way, with particular emphasis on interoperability . MDA defines an approach that separates the system functionality specification from its implementation on a specific technology platform. In this way, the system architecture can be language, vendor and middleware neutral. The Computation Independent (or business domain) Model (CIM) is one in which the computational details are hidden or as yet undetermined. The Platform Independent Model (PIM), expressed in UML , describes computational components and their interactions in a platform-independent manner. The PIM represents the logical view in which the composition and behaviour of all components (but not their implementation) are fully specified. The Platform Specific Model (PSM) is expressed in terms of the software development platforms, software standards and network protocols of the specification model of the target platform. Since the PIM, by definition, does not contain technical details, it is envisaged that the PIM will be mapped to one or more platform-specific models (PSM). The PSM is a refinement of the PIM to target platforms such as Microsoft .NET (COM+), Enterprise JavaBeans (EJB) or the CORBA Component Model (CCM). The PSM represents the source code or its UML representation. There can be as many PSM as there are different implementations of a given PIM. Our system was designed using three levels of abstraction as defined in the MDA methodology. At the most abstract, Computation Independent System (CIS) Model level, the proposed system would be described as shown in Figure 2. 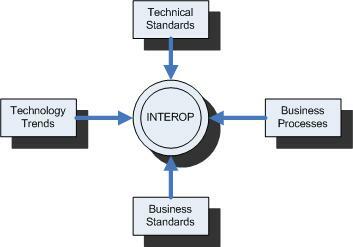 This abstract model illustrates the interoperability requirements for different software applications owned by the same or different enterprises that are expected to interact with each other. The various transactions schematically illustrated in Figure 2, entail a variety of interactions between the applications and lay out a set of complex functional and non-functional requirements for the system to be designed and implemented, which must be examined at the lower modeling levels. It should be noted that the CIM model is abstract enough to encompass any system architecture, including both client-server and distributed approaches. The use of MDA describes and represents interactions between entities, and not the way in which they will be implemented. The choice of architecture and components that will be utilized is up to the next model level. In refining the CIM model to produce the Platform Independent Model (PIM), the top-level system architecture needs to be designed. In the PRAXIS system design phase it was decided  to adopt a client-server architecture, consisting of a central server performing communication, mediation and store-and-forward activities, and a set of client applications that will run on the connected enterprise sites. The server, which does not appear in the CIS model, needs to be part of the PIM model, in order to produce a valid system description that will be further refined at the platform-specific level. Figure 3 illustrates the PIM level model for (a subset of) the PRAXIS system (simplified for clarity). The model is divided in two main modules, the server and client. The PIM design is based on UML notation  and provides the bridge between the abstraction and the realization. The transition from the PIM to the PSM model consists of defining specific technologies and infrastructures for the various components of the system. These mappings fill the gap between the abstract model and the Platform Specific Model. The realization of our system is depicted in Figure 4. § The server was implemented on the .NET platform, using a mixture of C++ and C# code. § Data is stored in an MS SQL Server Relational Database. A Fat (Thick) Client, based on an existing ERP system. A Thin Client, a typical win32 application that implements the basic functionality of the system. This will be implemented in Visual Basic .NET. A Web Client, a web application that provides limited access for enterprises, which do not have an ERP system installed. These three types of clients were provided in order to reach out for SMEs that do not have the capability to support expensive ERP systems. The communication is layered as illustrated in Figure 5. The base protocol is based on SOAP. Other protocols that might be needed to achieve interoperability between distinct systems are supported through layering them on top of SOAP, making the necessary transformations where appropriate. This paper has presented the application of the MDA approach in the design of a client-server application to support interoperability among enterprises. It has illustrated the refinement steps that lead from the more abstract to the technology-specific models, pointing out the specific patterns of the design. We are convinced that these patterns can be extracted and later used as common practice in similar situations. A direct extension of our work may include the employment of Ontology-based approaches to be defined in order to provide common knowledge    . Institute of Electrical and Electronics Engineers. IEEE Standard Computer Dictionary: A Compilation of IEEE Standard Computer Glossaries. New York, NY: 1990. Yannis Charalambidis, Vassilios Karakoidas, Stephanos Androutsellis-Theotokis and Diomidis Spinellis, Enabling B2B Transactions over the Internet through Application Interconnection : The PRAXIS project, e-Challenges 2004, Vienna, 27-29 October. RosettaNet. Rosetta Implementation Framework (RNIF): Core specification Technical report, RosettaNet, March 2002. Checkland, P. Information, Systems and Information Systems: Making Sense of the Field, John Wiley & Sons, Chichester UK.